This Sunday, 8th July, the Pop-up Vintage Fair will be appearing in Hampstead for the last time before their summer break. "Last chance before the summer break to pick up some Summer Vintage Bargains at the Pop Up Vintage Fair at St Stephen’s Rosslyn Hill, Pond Street, Hampstead NW3 2PP on Sunday 8th July. Just up the road from Belsize Park Tube Station (Northern Line). Lots of lovely Summer vintage stock to choose from including festival maxi dresses, tea dresses & denim shorts. As well as designer & affordable vintage fashion there’ll be vintage accessories, vintage spectacles & sunglasses, jewellery, homeware, handpainted furniture, antiques, collectables & more. Pop by the Pincurls and Pout stand where professional makeup & hair stylists Jeanie & Betsy can recreate that perfect vintage hair & makeup from any decade – 30s/40s bombshell, 50s rockabilly, 60s chick or 70s hippy, whichever decade is your favourite! 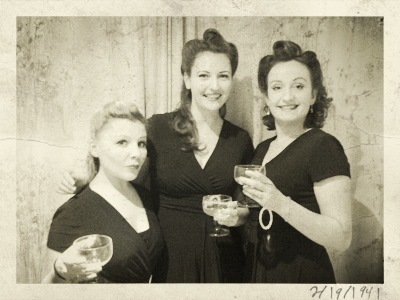 Back by popular demand the harmonising trio The Wayward Sisters will be performing some good old-fashioned toe-tapping tunes to entertain us! After all that shopping and preening, sit back and enjoy tea with homemade cake, or afternoon cream teas in our Pop Up Vintage Tea Room. If the sun is shining the courtyard will be open for tea in the sunshine!"